(Nanowerk News) A new high-performance anode structure based on silicon-carbon nanocomposite materials could significantly improve the performance of lithium-ion batteries used in a wide range of applications from hybrid vehicles to portable electronics. The popular and lightweight batteries work by transferring lithium ions between two electrodes – a cathode and an anode – through a liquid electrolyte. The more efficiently the lithium ions can enter the two electrodes during charge and discharge cycles, the larger the battery's capacity will be. The new nanocomposite material solves that degradation problem, potentially allowing battery designers to tap the capacity advantages of silicon. That could facilitate higher power output from a given battery size – or allow a smaller battery to produce a required amount of power. 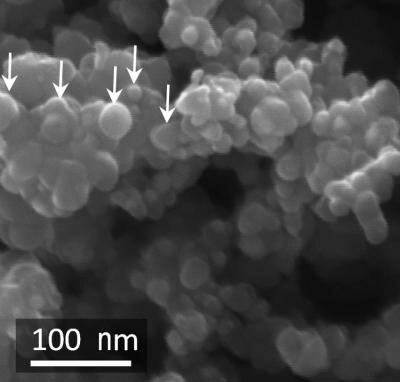 This scanning electron micrograph shows carbon-coated silicon nanoparticles on the surface of the composite granules used to form the new anode. Fabrication of the composite anode begins with formation of highly conductive branching structures – similar to the branches of a tree – made from carbon black nanoparticles annealed in a high-temperature tube furnace. Silicon nanospheres with diameters of less than 30 nanometers are then formed within the carbon structures using a chemical vapor deposition process. The silicon-carbon composite structures resemble "apples hanging on a tree." Using graphitic carbon as an electrically-conductive binder, the silicon-carbon composites are then self-assembled into rigid spheres that have open, interconnected internal pore channels. The spheres, formed in sizes ranging from 10 to 30 microns, are used to form battery anodes. The relatively large composite powder size – a thousand times larger than individual silicon nanoparticles – allows easy powder processing for anode fabrication.